Minnesota Rep. Keith Ellison, the deputy chair of the Democratic National Committee, misled the public for years about his relationship with Farrakhan, new reporting has shown and The Washington Post has acknowledged. Of the eight Democrats with ties to Farrakhan, four of them have repeatedly declined to denounce Farrakhan, despite outrage and pressure from Jewish groups. Farrakhan’s prominence on the Left isn’t limited to his newly revealed closeness with Democratic politicians. The leaders of Women’s March, a top progressive organization, have declared their support for Farrakhan and have refused to denounce him even as they alienate other progressives by supporting a rabid anti-Semite. The group’s co-president, Tamika Mallory, suggested that Farrakhan is right to call Jews his enemies and compared him to Jesus. CNN has largely ignored the growing scandal, even as other establishment media outlets, including The New York Times, ABC News, CBS and The Washington Post, have now begun to cover it. CNN published one article noting Farrakhan’s anti-Semitic speech but it did not include the new evidence of ties between Farrakhan and Democratic politicians. CNN has yet to publish a single article outlining the new evidence of relationships between Farrakhan and Democratic politicians, as of this article. CNN’s on-air coverage of the Farrakhan scandal has been limited to a one-minute segment on Jake Tapper’s “State of the Union,” and one question that Wolf Blitzer posed to Ellison at the end of an interview in February. Aside from those two brief instances, the Farrakhan scandal has been entirely missing from CNN’s on-air coverage. The Daily Caller News Foundation sent a list of questions on CNN’s absent coverage to a company spokesperson but has yet to receive a response. CNN’s coverage of a speech former White House chief strategist Steve Bannon gave in France on Saturday makes for a sharp contrast with the network’s blackout on the Farrakhan scandal. In his speech to France’s right-wing National Front Party, Bannon said, “Let them call you racists. Let them call you xenophobes. Let them call you nativists. Wear it as a badge of honor.” CNN made Bannon’s remarks its lead story. Tapper, unlike his CNN colleagues, has repeatedly called out Democratic politicians and the Women’s March leaders for not condemning Farrakhan. “It’s really not difficult at all to condemn this anti-Semitic, nonsensical bilge. 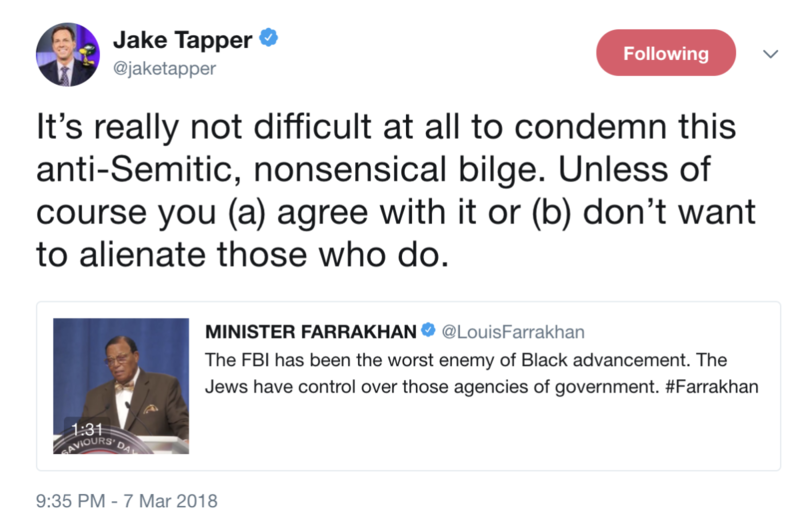 Unless of course you (a) agree with it or (b) don’t want to alienate those who do,” Tapper wrote in one Twitter post, quoting a video where Farrakhan claimed Jews are secretly turning America’s intelligence agencies against black people. Tapper asked Vermont Sen. Bernie Sanders about Farrakhan on Friday during an interview at the South by Southwest festival in Austin. Sanders, an Independent, said he was willing to “take on” Farrakhan for his anti-Semitism and compared the hate group leader to President Donald Trump. CNN buried that answer at the bottom of an article about Democratic infighting. The article referenced only “the left’s hesitation in condemning Farrakhan’s speech” and did not note the new evidence tying Democratic politicians to Farrakhan. The article also did not note that Davis defended Farrakhan as “an outstanding human being,” or that Women’s March leaders have repeatedly and unapologetically defended Farrakhan. As of this article, CNN has yet to publish an article informing their readers of the new ties between Democratic politicians and one of America’s most notorious racists and anti-Semites.